Sometimes your job or life will have you traveling to another city. These days, no matter where you travel you need to stay in touch with people back home. So how to do you stay connected while traveling? Now a lot of hotels have free WiFi and mobile phone companies have free long distance calling throughout their network. If you are making long distance calls with your mobile, make sure you check your plan before you call. There can be very expensive roaming charges if you are calling from a different country. This isn’t a nice way to celebrate your return from a great vacation or successful business trip when you get your mobile bill in the mail. If I'm using my mobile to call my home coverage area, I prefer to check the rates before I travel. When I use to do a lot of international travel, I had a monthly phone plan to reduce the cost. It gave me a lot of international minutes for a monthly fee. I didn't always use all the International minutes, but I always new the cost of my mobile bill, no surprises. When I started to travel less, I dropped the monthly plan and got an International roaming package. This included International roaming minutes, text messages and data. As long as you stay under these limits, you know what your additional monthly fees will be. How many days will you be traveling for? Are you expecting to make or receive a lot of phone calls? Will you be in an office where you can use their phones? Will you be able to get free WiFi and use voice over IP (VOIP) to make calls? And sometimes it's cheaper not purchase a roaming package at all. You will pay a little more for long distance phone calls, but this is okay if you do not make a lot of calls. This is something you need to closely monitor. If you start to make a lot of International calls, you can probably add a package to your mobile while you are traveling. Bear with me, because I'm going to show you a few tricks to make free calls while you are traveling. 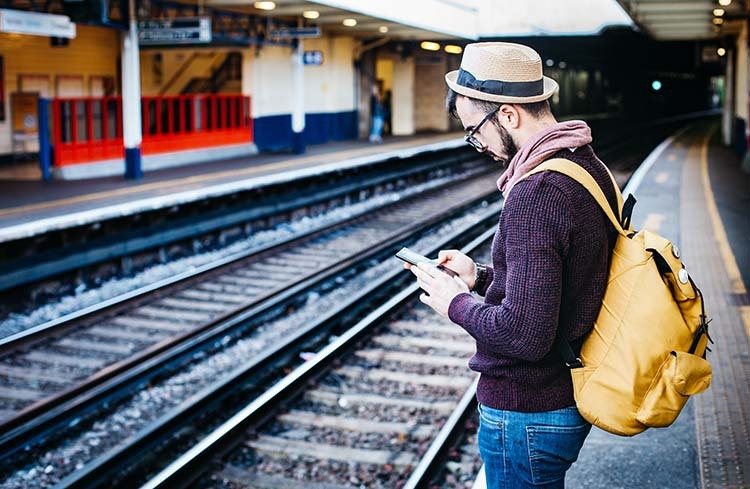 One of the best ways to stay connected to the Internet while you are traveling is to use free WiFi. With all the technology available and WiFi you can do a lot. From making phone calls to checking your email and downloading updates for your important presentation. Some hotels offer free WiFi in your room and some don’t. Best to check what you get when booking your room. I also double check when I'm checking in. You usually need to know the SSID and password to access the WiFi. The person at the front desk can usually give you this information. You may also find the WiFi login instructions in your room. Usually on a small piece of paper or brochure on the desk beside the phone. If the hotel charges for in-room WiFi there may still be a way to get it for free. Most hotels offer free WiFi in the lobby. Not as convenient as in your room, but it can save you a lot of money. If you are working on emails, you can write all of your emails in your room and then go down to the lobby to send them. And receive any new emails. Here's another way to stay connected while traveling for free. If you have status with the your hotel rewards program you might be eligible for free WiFi in your hotel room. When I was traveling more often and had Marriott Gold I got free WiFi in my room. I still had to set it up like I was going to pay for it, but there was no charge on my bill when I checked out. More tips on connecting to free hotel WiFi. Okay, you can't get connected on free WiFi, but you still need to stay in touch. International roaming can be expensive, but there's still options to reduce the charges. Not free but at least you can save some money. If you are only checking and sending email you can use the data on your mobile. I recommend you turn off data when roaming until you really need it. This will make sure you don't start surfing and forget you are roaming or worse and application gets automatically updated. That can get expensive quickly. If you are traveling in a group, see if anyone has access to free or inexpensive WiFi. If there phone allows it, they can setup their phone as a WiFi hotspot. I've done this when on a business trip with a local person. They were not roaming and could allow me to use their data. I've also done this for friends or family on my iPhone 5 when I'm not roaming. Here's another trick I used to stay connected while traveling in Europe a few years ago. I purchased an Orange WiFi day pass. This is also called a pre-paid voucher. If you are not familiar with Orange, they are a wireless carrier like AT&T or Verizon in the US. I was there for a few weeks and I got the 10 hour WiFi day pass. It gave me 10 hours of WiFi access and it was valid for 30 days. I purchased it online while I was in Franco, but you can also buy them at stores or hotel lobbies in Europe. The nice thing is you get access to any of their WiFi hotspot. In France Orange has 30,000 hotspots, so they have a lot of coverage. They usually have a time limit. So you want to get connected to the Internet, get your work done and disconnect. If you stay connected for 10 hours and are not sending or receiving data you are still using the available time. The pass is only available for so many days(s). For example, for the Orange 1 hour pre-paid voucher you get 1 hour of wireless Internet connectivity to be used within 24 hours from first login. For the Orange 10 hour pre-paid voucher you get 10 hours of wireless Internet connectivity to be used within 30 days from first login. 10 years ago I started working for a company based in Europe and I worked with customers in the US and Canada. My first cell phone bill was over $2000 – yikes! This was an expected cost and I was able to expense it – phew! When I started using Skype my mobile bill dropped to $600 a month. This was a great savings. I was paying $15 month for unlimited world calling with Skype. At first the service wasn't perfect, but for the last few years it has been simply amazing. I use it mostly on my laptop, but you can also use it from your mobile phone if you are on free WiFi. More information on using Skype a Voice Over IP technology. Besides Skype, I also like WhatsApp for free communication options. Whatsapp is a free application that I run on my iPhone. It's also available for use on Android , Windows Phone, Mac or Windows PC . So what is Whatsapp? From the Whatsapp website: With WhatsApp, you'll get fast, simple, secure messaging and calling for free, available on phones all over the world. As you can see, there's lots of options to stay connected while traveling. Some days are easier than other days and every thing works. Other days you need to do a bit of work to get connected. And some days nothing works and it's time for a break. But hopefully these tips help and it's smooth sailing. If you have some additional tips or questions please email me using the contact form on this website. I would love to hear from you and post your comments and questions.